You don’t have to head to your favorite restaurant to get an over-priced glass of this stuff. You can whip up a sweet, refreshing glass of homemade strawberry lemonade at home. Strawberry lemonade has long been a favorite drink of mine. When we lived in Oregon, one of our favorite inexpensive date night restaurants was Red Robin. I’m addicted to their fries, and their freckled lemonade never ceases to brighten my day. Now that we live in Mississippi, the closest Red Robin is more than three hours away. I’m sure there are other, closer restaurants that serve it, but I don’t need them anymore. 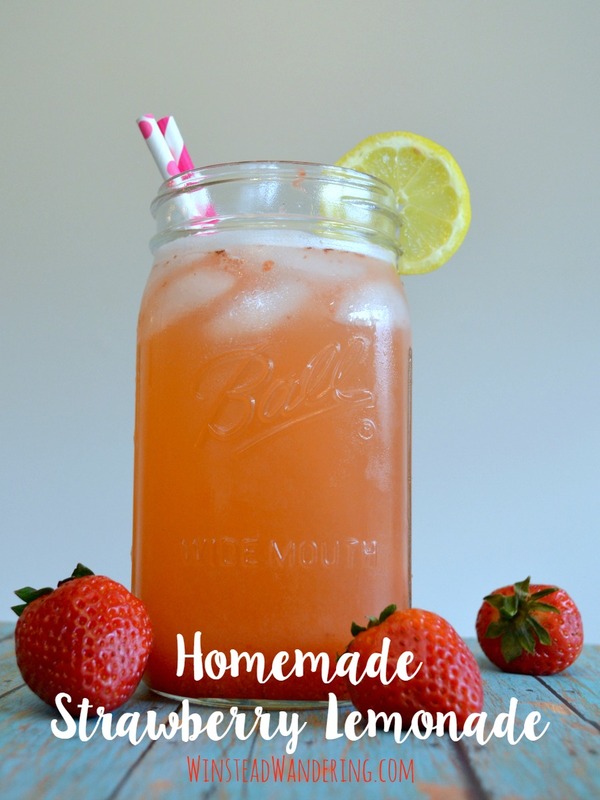 I perfected this homemade strawberry lemonade more than three years ago and I haven’t looked back since. I grab a pound of strawberries and whip up a batch to celebrate the start of strawberry season every year, and I spend the rest of the spring and summer looking for any excuse to make it again. I tend to keep a pitcher of homemade lemonade in the fridge, making the whole recipe that much easier to throw together. 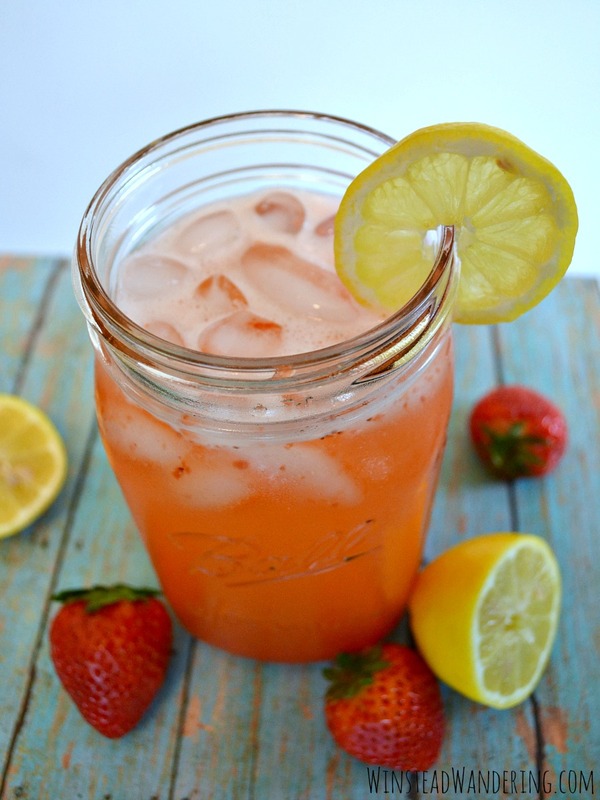 This homemade strawberry lemonade gets rave reviews from everyone I serve it to. The lemonade itself is wonderfully tart, with a perfect balance of sweetness. With the addition of the flavorful strawberry sauce, the whole thing is refreshing and sweet and drinks like a glass of summer. To make the strawberry sauce: In a medium saucepan, combine the strawberries, vanilla, and a quarter cup of sugar. Turn heat to medium and stir constantly as the berries cook down, for three to five minutes. Remove from heat and allow mixture to cool. When it’s cooled, puree the sauce using an immersion or standard blender. If you don’t have either of those, use a potato masher or a heavy mug to mash the berries. Store in a sealed container in the fridge until ready to use. Note: this sauce is awesome for so much more than just strawberry lemonade. Try it on pancakes or waffles, cheesecake, or to spice up plain water. To make the simple syrup: combine the remaining two cups of sugar and two cups of water in a medium saucepan. Stir together and bring to a boil, stirring occasionally. When the mixture starts to boil and the sugar is dissolved, remove from the heat and allow syrup to cool. Store in a sealed container in the fridge until ready to use. To make the lemonade: in a large pitcher, combine the remaining eight cups of water, the two cups of lemon juice, and one and a half to two cups of simple syrup. Stir together and test for taste. Adjust amounts to suit your preferences. Store the lemonade in the fridge until ready to serve. Right before serving, pour the lemonade into individual glasses and add two to three tablespoons of strawberry sauce. It doesn’t get much better than homemade beverages. Make sure you check out copycat Sonic strawberry limeade and iced caramel coffee. This looks delicious! The fun teas and lemonades always tempt me at restaurants, but this looks like the perfect substitution. It is the perfect substitute! We live so far away from any of those convenient drive through coffee and drink stands, so I love that I can make something this refreshing at home. Strawberry lemonade is the best kind of lemonade! This is literally the most perfect summer time drink! I think I might actually serve this at my bridal shower picnic! Thanks for sharing!! I agree, Christina, strawberry lemonade is perfect for summer, and it would be perfect served at your bridal shower picnic (which is also a really fun idea)! I hope you go for it!